Instant PDF Password Protector is the Free tool to quickly Password Protect PDF file on your system. With a click of button, you can lock or protect any of your sensitive/private PDF documents. You can also use any of the standard Encryption methods - RC4/AES (40-bit, 128-bit, 256-bit) based upon the desired security level. In addition to this, it also helps you set advanced restrictions to prevent Printing, Copying or Modification of target PDF file. To further secure it, you can also set 'Owner Password' (also called Permissions Password) to stop anyone from removing these restrictions. 'PDF Password Protector' includes Installer for quick installation/un-installation. It works on both 32-bit & 64-bit platforms starting from Windows XP to new Windows 10 version. Owner Password: Owner password is protect the restrictions imposed on the PDF file. Owner of PDF file may impose restrictions such as Copying, Printing, Signing, Editing etc. These restrictions are protected with so called Owner Password so that no one else can change it. Generally you can protect your sensitive PDF files with normal password (user/document open password). However if you want to set advanced restrictions such as copying/printing etc then you also need to set 'Owner Password' (also caleld Permissions Password) to prevent anyone removing these restrictions. You can easily set these restrictions along with password using 'Advanced Settings' dialog in PDF Password Protector. Instant PDF Password Protector comes with Installer so that you can install it locally on your system for regular usage. It has intuitive setup wizard which guides you through series of steps in completion of installation. 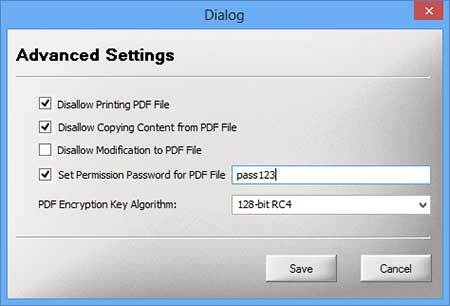 Instant PDF Password Protector is easy to use with its simple & attractive GUI interface. Launch Instant PDF Password Protector on your system after the installation. Select the PDF file to be protected either by clicking on Browse button or dragging file from your system. Now with version v2.0 onwards, you can just right click on any PDF file and password protect it as shown in the screenshot 3 below. Screenshot 3: Right click context menu to quickly select and password protect any PDF file with just a click. Major 2016 edition with improved Installer/Un-installer screen. Also fixed the context menu problem in Windows 10..
Major release with support for new Windows 10 as well as latest Adobe Acrobat Reader DC version. Also fixed the sizing problem with higher resolution computers. Mega version with support for right click context menu to easily Password Protect selected PDF file. Also integrated Uninstaller into Windows Add/Remove Programs. 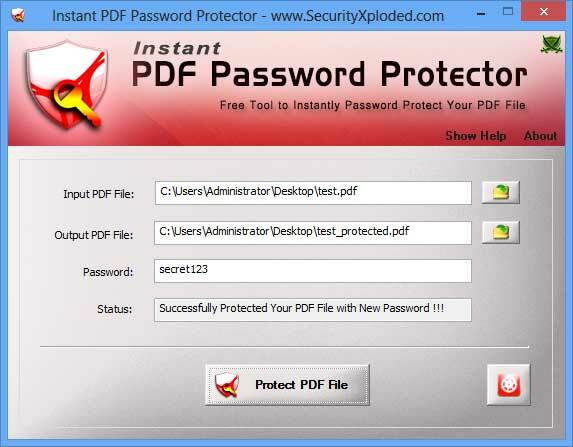 Instant PDF Password Protector is not a hacking or cracking tool. It can only help you to protect or lock pdf file to prevent any unauthorize usage.